When I improvise or noodle on the guitar without a chord progression and tempo/drum beat behind it, I can express myself without bothering what I am playing quarter note, eight note etc. But with chord progression behind it I am kind of stuck. My ideas don't flow. I am like playing the same thing again and again. This is understandable. Many guitarists find it easier to improvise without anything underneath them. You're free to set your own time signature, tempo and move in and out of different scales and keys as you please. That's the beauty of pure solo guitar and it's valuable time to have. When it comes to playing lead as accompaniment, however, you need to make sure you take small steps. There are two fundamental skills you need to be conscious of with lead/scales - timing and note selection. It sounds like you have a grasp of timing as you mentioned some note values (quarter, eighth, sixteenth notes). This is all outlined in the practicing guitar scales lesson. This shows you how to use the metronome to develop a fundamental sense of timing (quarter notes, 8th notes, 16th notes) when moving around the scale. Remember, the metronome is the most basic, but most fundamental form of accompaniment. Even if you're not playing over a chord track, use a metronome to keep your brain geared and ready for when you are required to play in a band context. If you get into the habit of noodling to a metronome or, even better, a drum track, you will at least have the timing element covered. If you then struggle when it comes to playing over chords, you'll know it's not to do with timing. 1) Runs - where you move up and down a scale in quick, often staggered note succession. 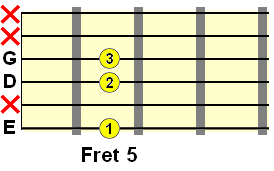 2) Vertical movements - where you move across two or more strings on the same fret. 3) String skipping - instead of moving from one string to the next, you skip over the string to create wider note intervals. 4) Intervallic movements - this is where you move through the scale in groupings of intervals, such as 3rd, 4th, 5th etc. I'll be covering this in a coming lesson. 5) Arpeggiation - link your regular scale phrases with arpeggios. 6) Pedal notes - a difficult one to explain, so see the lesson! 7) Pentatonics - these can be seen as cut down versions of whichever major/minor scale you're playing. Interlinking your scale movements with pentatonic flourishes will bring out phrasing ideas. The key thing with all these navigation methods is to know your destination notes. Choose a safe landing note for the chord on which your phrase ends and play towards it with purpose, using one of the methods above. This note will most likely be a chord tone, i.e. a tone that is used in the backing chord. By having a target note firmly in mind, you'll no longer be meandering up and down a scale aimlessly. You need that destination to put your scale phrases into context. Try playing towards it using different navigation methods listed above. There are other elements involved in building a phrase, but simply put: scale navigation + target notes = phrases. Start with a very simple, 3 note phrase, using the target note concept. Try navigating to that target note using different parts of the scale. This is about training your mind and ear to fully explore the scale pattern and expose potential ideas you like the sound of. That's another crucial point - you have to feel some meaning behind what you're playing, and to do that you must find a sequence of notes that resonates inside you. Sounds a bit airy fairy, I know, but without this element, your music will sound too calculated and inexpressive. To start really simple, I'll just use A minor pentatonic. At first, just take the first chord in the sequence - Am in this case - and pick a suitable target note for your phrases. This is a note you can hold comfortably over the chord (e.g. a note that harmonises nicely with the chord). Once you've chosen your target note, set your metronome to 100BPM (or whatever is comfortable for eighth notes) and start building simple 3 or 4 note phrases that lead to the target note, using different parts of the scale. Ok, so these are starting to get a bit tedious now! But the point of this exercise is to get you thinking about different approaches to the same target note. In a way, because you're limited to 3 notes, you're forced to make unconventional movements around the scale to "say more" with such few "words". Now, you have two choices here. You can either start adding in lead elements such as bends, legato, slides etc. to your 3 note phrasing exercises, or you can start adding in additional notes. Remember to change your 3 note phrase each time around, but stick to one target note for all your phrases as this repetition will help train your ear to hear the "pull" towards a particular target note from different parts of the scale. Only change the target note when you feel you've exhausted all your 3 note phrasing options. Next, try building 4 and 5 note phrases and again add the flourishes either side (or add in lead elements). You can always change to the next chord and use the same process (using the same Am root scale) to build some phrases. Of course, there's a lot more to phrasing than what's been covered here, but this was more of a "quick start guide". I'll be expanding on this process in a coming lesson series. In the meantime, I hope using the process outlined here sparks some ideas. You can apply it to any scale you might learn. I am amazed and thankfull for the quick response to my question.The suggestion I received is brief and to the point(practical). I am a self taught guitarist and there are a lot of questions that I want to ask to a professional guitarist but,who cares to teach or explain without $$$. This site is different from many others online guitar sites. Keep doing the gr8 work. I just can't seem to make any scale sound good but the pentatonics.Is there help for that? To "old but new player", have you see my lessons on soloing over chords and chord progressions? See my YouTube Channel. Hope it helps.